Last Sunday was round 7 of the Inkart Championship at Daytona Manchester. 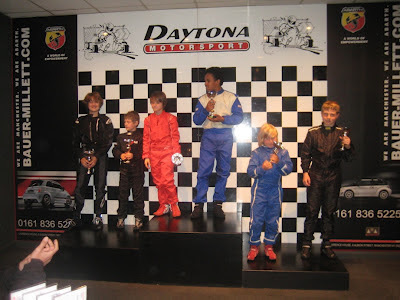 Samuel had two second place finishes and a fifth in the qualifying rounds and was placed third on the grid in the final. Video below of the start of the race - didn't manage to tape it all in one go as the camera battery died part way though! 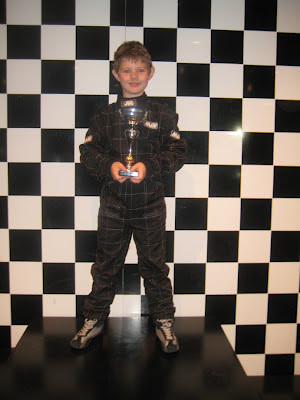 Samuel moved up to second on the first hairpin and stayed in that position to finish second. Here he is on the podium with the other Cadet drivers and the Juniors. Samuel actually did his fastest lap to date too - he's now completed the new track layout in 29.561 seconds, knocking almost 0.2 seconds off his previous best! He has now moved up to second overall in the Cadet Championship. And we just have 4 rounds left in the season.